For small households, a single cup coffee maker can be a terrific choice. They're generally smaller, leaving you with more counter space, and often brew right into a travel mug for hot and portable coffee. What is the best single serve coffee maker​? Why Buy A Single Serve Coffee Maker? 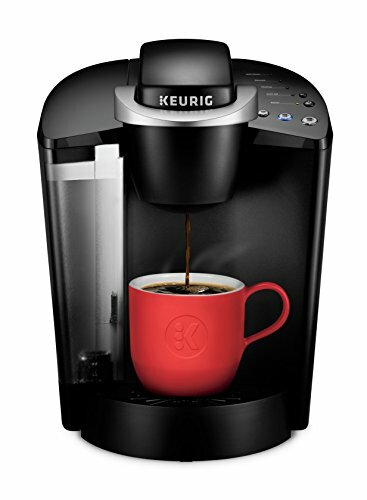 The classic Keurig K55 works well with Keurig pods, non-Keurig pods and refillable pods. This machine features a removable water reservoir for easy filling. Once you turn on the power, this coffee maker will stay on for two hours before shutting off automatically to save power. However, once powered up it heats the water quite quickly. Flavor Options: Thanks to the wide variety of K-Cups available, you can customize your morning beverage options for the whole household. 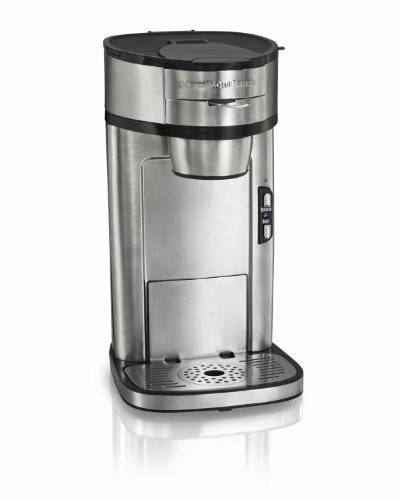 Automatic Features: Water flow stops when the brewing is complete; the machine turns off automatically after two hours. This machine takes care of itself in many aspects. Sturdy: The base of this tool is flared slightly and results in a very sturdy coffee maker, unlikely to tip even if bumped. Waste: Plastic ﻿﻿K-Cups are not reusable and may not be recyclable in your area. Messy: There's no auto-shutoff that occurs if the pod is not pierced properly. Clogs: The water transfer tubes inside the machine can become clogged with coffee grounds, leading to a non-existent water flow. The Bunn MCU is a terrific addition to any household. Whether you enjoy hot tea, fresh coffee or any of the flavorful beverages available in K-Cup format, the Bunn MCU can work in your space. This unit includes four different baskets: a cup drawer, a ground coffee drawer, a pod drawer and a water drawer. While the machine doesn't offer a spot for storing these drawers, they do stack well and don't take a lot of space. For those who like hot water in the morning for oatmeal or to m﻿﻿﻿﻿﻿﻿a﻿﻿k﻿﻿e a cu﻿﻿p of tea, a clean water drawer that produces no coffee flavor will be extremely helpful! Pulse Brew Option: While this machine doesn't make espresso, you can increase the intensity of your coffee flavor by using the pulse brew option. Many Brewing Options: The removable cup tray makes it possible to brew tall cups and travel mugs. You can brew from 4 to 14 ounces per serving with this machine. Loose Tea Brewing Cup: Loose tea can be brewed in the same cup as ground coffee. Storage: There are no storage options for the different brewing cups. While they are stackable, you may not want stuff stacked on the counter. Set Up: The set up on this machine will take some time and attention; the Bunn MCU maintains a constant reservoir of 14 ounces of water. Be sure to follow the instructions. Leaks: There are reports of leaks, either from the K-Cup drawer or the coffee drawer. The DCC-3000 actually brews several cups and then dispenses them one cup at a time. It comes with a charcoal water filter to remove any chlorine filter. This unit features a permanent gold filter and paper filters are available as well. There's an auto-shutoff maker and a cleaning setting. The display on the DCC-3000 lets you program the coffee maker and check the amount of remaining coffee in the brewing reservoir. Finally, when you pour a cup, a small light in the coffee maker lets you see how much coffee is in your cup as you pour! Clean-Up: Clean-up is easy with this machine; the water reservoir, coffee filter basket and coffee reservoir are all easily removable. 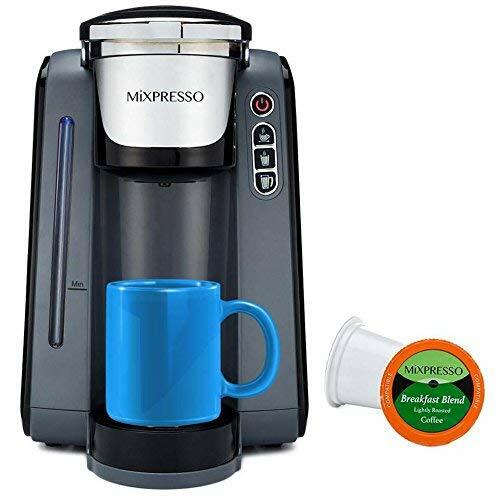 Easy to Program: You can program this machine up to 24 hours in advance and brew up to 60 ounces of coffee per brewing time. Removable Drip Tray: Filling up your travel mugs and tall cups is easy thanks to the easy to remove drip tray. Plastic: Once you've brewed your coffee, it lingers in a plastic container until dispensed. If plastic contamination is a worry, you probably don't want this coffee maker. Drips: Once the reservoir is full, some users have found the dispenser drips, fills the cup tray and can make a mess. Retractable Cord: The power cord for this is retractable, can be difficult getting it out of the machine. The Mixpresso has a sizable water reservoir on the back, so it won't take a lot of monitoring to make sure you're ready for your next K-Cup beverage. 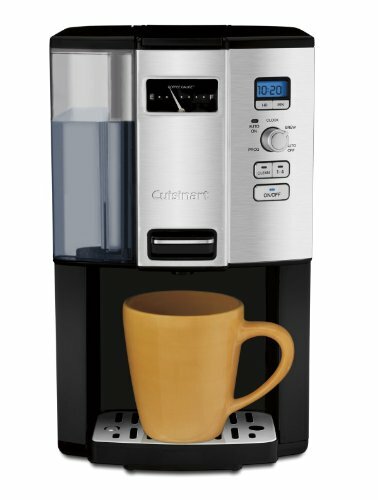 This unit brews 6, 8 or 10 ounces and works with Keurig 1.0, 2.0 and unlicensed K-Cups. The Mixpresso has an auto shut-off and an easy to read display. Flexible: A 7" tall travel mug will fit well in this machine once you pull out the drip tray. Temperature: This unit may brew hotter than Keurig coffee makers. Piercing: The mechanism that pierces the coffee pod is not sturdy and can pull off the machine. Leaking: If the pod is not pierced properly, water will leak everywhere as you try to brew your beverage. Exploding: If the pod is pierced but the brewing water cannot escape the pod containment basket, this unit can "explode" and throw hot water and grounds everywhere. 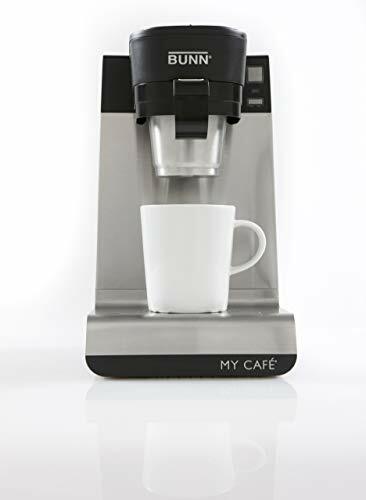 The Mr. Coffee single cup coffee maker comes with its own refillable pod for easy, consistent flavor. This unit will brew K-Cups as well as other pods. The cup stand is flexible and can be shortened for tall cups or removed for travel mugs. Lightweight: This machine is extremely lightweight and easy to move for filling. Fresh Water: To make 10 ounces of coffee, you add 10 ounces of water, so you're always brewing with fresh water. Easy to Clean: This machine has few moving parts; follow the instructions for set-up and cleaning and you can enjoy fast, fresh coffee! Small Reservoir: While this unit claims to brew a 10 ounce cup of coffee, if you add more than 9 ounces of water, it spills out the back. Lightweight: This unit is small enough to be unstable and can tip easily. The Hamilton Beach 49981A is constructed of durable stainless steel and will look terrific on your counter! The permanent mesh filter basket requires no pods or K-Cups and can work with some paper filters. The coffee stand is flexible and works well with tall travel mugs and regular cups or mugs. This machine weighs in at just over 5 pounds and has enough heft to keep it from tipping when bumped. No Pods! : For fans of plain coffee, this coffeemaker is ideal. No fussing with special filters or pods; simply add coffee grounds, water and push brew. Increase the Intensity: You can boost your brewing intensity by activating the Bold button. Easy to Clean: All aspects of this machine are easy to get to and clean, from the filter mechanism to the water reservoir. Water Priming: This unit does need a certain amount of priming water. When you make your first cup, be aware that some water will stay in the machine. Plastic: The water reservoir and coffee brewing basket are made of plastic. Filtration: You may need to cut down standard filters to get them to fit inside this coffee maker. any escaping steam from the top has time to cool before it damages your cabinets. Pod coffee makers brew single cups of multiple beverages. Hot cocoa, apple cider and various teas can also be brewed in your Keurig or Keurig alternative. Pod coffee makers are fairly straightforward; add water, place your pod, load the pod into the piercing mechanism so the coffee can be accessed, and brew. Challenges on these machines include a failure of the loading mechanism over time. Consider brewing into a travel mug for heat retention. All coffee brewed into an open cup will lose heat rapidly. Heat can be lost in any transfer of coffee that pours into an open cup. The large surface area of the cup, exposed to ambient air temperature as the coffee brews, may produce a cup that is not as hot as the drinker expects. All electric coffee makers are subject to scale and scale-related damage to rubber seals and gaskets. Monitor your pot for excess steam or leaking; scale may be impeding the function of the pot.​ You will need to take time to descale your coffee maker. Single serve coffee makers offer small households and travelers an ideal way to prepare coffee in a small area or on the go. These coffee makers are portable and flexible. Pros: Customizable hot beverages for every taste in easy to store containers. Cons: Hard to recycle plastic waste. As pod machines have gained in popularity, the accessories available have become extremely creative. Multiple flavors of coffee and other hot beverages make it possible for the owner of a pod machine to satisfy nearly every taste. Keurig coffee makers and Keurig alternatives have one thing in common; the mechanism that punctures the pod can occasionally fail, leading to a huge mess on your countertop. There are several non-pod single serving coffee makers that offer users the chance to brew a custom cup specific to their taste. Many of these pots offer a flexible stand for the coffee cup, so the user can either brew into a tall travel mug or set a regular cup on the stand and brew only one cup. One of the benefits of the small design of single serve coffee makers is their low cost. While some pod machines can have a high price tag, many small coffee makers are kinder to your budget. If you need a coffee maker for your home and another for your office or pod, the price may be right! Small paper filters are commercially available for single cup coffee makers, and many of these machines feature a gold or permanent filter. It's critical not to overload any coffee maker with fresh grounds as it may lead to filter basket overflow if the water can't get through the fresh grounds fast enough. Some of these machines offer programming so you can wake up to a fresh cup. However, as previously stated, brewing into an open cup can lead to a great deal of heat loss, so be sure you're up and ready for that first cup when the alarm goes off! There are also single-serving coffee makers that allow the drinker to manipulate this most necessary beverage, such as French presses, hand-held espresso pumps, and pour over coffee makers. While they take a bit more timing and work, these tools can make the process of preparing your coffee a great way to connect with the sensory aspect of coffee; that is, aroma, steam, color intensity and flavor. In addition to a French press pot, there are also French press cups. Simply add your coarse ground coffee to the cup, wet the grounds with hot water, then fill the cup and allow it to steep. In four minutes, press and enjoy. Coffee is a common beverage but a unique experience. Everyone has their favorite flavor, their ideal temperature, and their own opinion on flavor, creamers and sweetener. If early morning is not a great time for you to be transferring hot water, then a French press may not be a great fit. If you enjoy coffee but want prompt access to hot cocoa, a Keurig may be worth the investment.